This week we have a guest blog from Mark Lamey who was National Trust Gardens Advisor from October 2011- September 2015. Part of his role was to give support and advice to the team at Sissinghurst and therefore, I thought it would be interesting to hear his views about dealing with some of the challenges that arise when trying to conserve an historic garden. Sissinghurst courses through the veins of anyone with a passion for horticulture and plants. Once you walk through its gated entrance the real world is left behind as you enter a seemingly timeless space full of scent, colour, movement and beauty. All supported, importantly, within a structural framework of the old manor, hedges, paths and lawns. My first visit was with my grandparents in 1985. I was fifteen. They had recently retired from being head teachers in London, had bought a typical Kentish weatherboard clad cottage with five acres of orchard in Sandhurst and were looking for inspiration to create their own cottage garden to compliment the romantic feel of their new home. I remember that it was a beautiful summer’s day, it must have been in late June or early July as Rosa mulliganii was in full spectacular flower on the central arbour in the White Garden. It was busy with visitors, but I don’t recall it marring my enjoyment of the garden, which I immediately fell in love with as I took in with delight its huge plant packed borders. Somewhere in my parent’s attic is an image of me leaning on the parapet of the tower looking into the camera and wearing a huge pair of ‘eighties’ style sunglasses. Probably best that it remains stored away! On returning home we likely had a cup of tea and set about the task of marking out my grandmothers own herbaceous border on a scale to match those at Sissinghurst, this one set against the wooden walls of a barn rather than beautiful red brick. Possibly, taking advantage of having a young pair of hands in their grandson to use, we began cutting the first sods of turf that weighed heavy with Wealden clay. Similar to Vita, this border was a reflection of my grandmother’s unpretentious, amateur, but artistic gardening style and vision. It held a huge diversity of plant material including some transplanted from their previous Victorian garden. I can remember there being large golden plates of achillea, plants grown in yoghurt pots from the local WI sale, some gifted by other gardening friends and a few prized specimens bought from a local specialist nurseryman. Not satisfied with the dark stained timber backdrop to this border provided by the barn or rather old poultry shed, my grandmother painted its entire length white, which took a number of coats of paint before the dark timber beneath was hidden. This provided a backdrop to a wonderful variety of colour and form that the border would give throughout the summer months. Of course the planting in the Sissinghurst garden that I fell in love with in 1985 and that so inspired my grandmother to create her own border was not the work of Vita. It was that of her chosen successors as Head Gardeners, Sibylle Kreutzberger and Pamela Schwerdt. Both are captured in this image by Valerie Finnis together with Vita (left) and Beatrice Havergal (right) who founded Waterperry School of Horticulture for women, where Pam, Sibylle and much earlier, Valerie had trained. 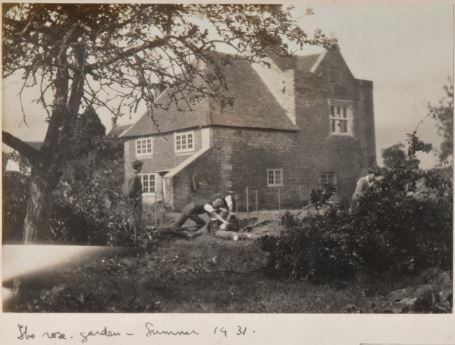 The image is taken from a publication of Valerie’s photography entitled Garden People by Ursula Buchan and now available online for the incredible price of just £5, inexpensive for a book that captures so well the fading light of a significant golden period of gardening in Britain that began, like the Sissinghurst garden, during the interwar years. Vita, Pam, Sibylle and Miss Havergal. 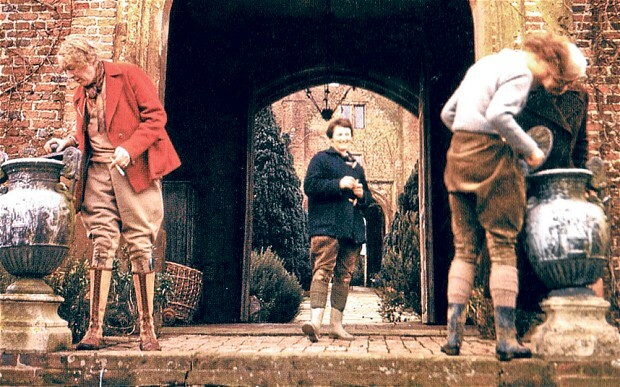 This image is also significant for capturing the passing of a gardening era at Sissinghurst. It shows Vita in her declining years as owner and gardener and the youthful vigour of Pam and Sybille who were taking on, organising and injecting vitality back into her creation. This rhythm of change is often apparent when understanding the history of a gardens development. At Sissinghurst, it wasn’t the first or even the second period of an evident ripple of change in the gardens creation during Vita and Harold’s ownership. The image below shows the extent to which, with a collective family enthusiasm and energy, the place begins to transform and reawaken from a sleeping ruin that hid under the vale of years as a farmstead. Here Nigel Nicolson (left) looks on as Ben (right) gets stuck into clearing the native holly and hawthorn hedging that enclosed what is now referred to as the Priest House during its transformation from worker’s cottage garden to rose garden. Harold Nicolson, perhaps keeping a close eye on and recording the gardens progression, is no doubt capturing the image. It represents the family involvement in the creation of the place and the first huge cycle of change. The second is post war when, as experienced amateur gardeners and with the security of income from Vita’s writing, Vita and Harold decide to create a larger rose garden on the site it occupies today and the Rose Garden now becomes the White Garden, destined to be one of the most influential and famous gardens in the world. Revealing and understanding the significance of these periods of change in the fabric of a garden’s history, is vital to ensuring they remain both relevant today and representative of the period in which they were created. Why consider the relevance today and not conserve a garden in time, as it is possible to conserve a painting or item of porcelain? Well gardens change, it’s inevitable as they are largely composed of plants, which respond to the dynamics of a seasonally stimulated lifecycle; they grow, mature and overtime die. How this change is managed and the extent to which change occurs is applied best when decisions are made about its future with the confidence of a deep knowledge of the place. From this level of understanding, inspiration for the most exciting, appropriate and creative interpretation of an historic garden is possible. As well as the inevitable change through the natural life cycle of plants in a garden, which can be managed through horticultural practises, there is that which isn’t possible to control, such as environmental or climatic changes; rainfall, temperature rise and extreme weather events. Another is the import of exotic pests and diseases often through the movement of people or trade with other countries. Management of both, takes the skill of adaptation without removing a garden design integrity or presence, quick and accurate identification of issues and the implementation of effective and practised control measures. One of the most relevant of all changes to a conservation organisation, such as National Trust and perhaps the most challenging to manage, is ownership. When property ownership moves from that of a single private individual or family to organisational ownership it is open to the scrutiny and opinions of a much wider group of people. It is also subject to the budgetary constraints of not just an individual property, but also that of the region in which it lies and with a central control. This can mummify a gardens development and prevent the much needed replacement planting and routine maintenance tasks from being funded. Sissinghurst is currently fortunate to have a General Manager who understands the need to spend well and invest in the garden’s day to day running and its future development. This is thanks to the success of the vital working relationship between Head Gardener and General Manager that Troy and Hester have built together. It is also supported by the guidance and expertise of a Gardens Adviser and an Historic Environment Panel of specialists who help to support decision making and discuss priorities for the garden’s future conservation. These relationships are inevitably finite in an organisational structure where so many opportunities to develop a career exist. That isn’t to suggest that change will happen soon at Sissinghurst and let’s hope this current period of stability is retained for many years, but it does raise a point for future consideration of how to maintain a continuity of care across the greatest gardens in Trust ownership. I suspect an answer may lie in the encouragement of a wider national network of the most significant Grade I Trust gardens where talent, expertise and training can be shared and perhaps in future a dedicated central funding for gardens as well?